How did you become a street artist? 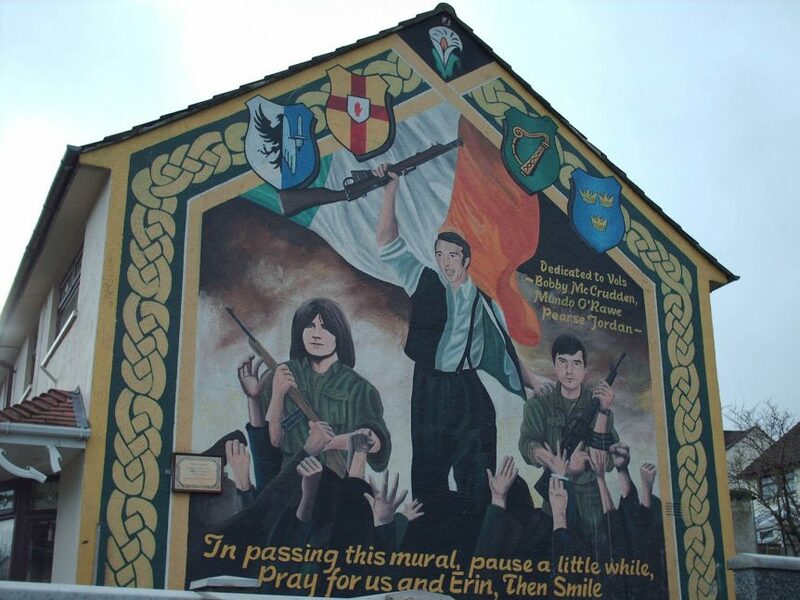 Growing up during the hunger strikes, I was surrounded by large murals in my local community. I didn’t necessarily appreciate the political content but if you connect my Dad’s drawings in the house with the huge murals I would see every day, then that shapes my approach to art. I wasn’t really someone who would sit all day in a studio working on an artwork. I’m also a people person. I like being out and about and I like working with communities. There is another element that I like about Street Art and that is the idea of making big statements in the public domain. If you combine all of that, Street Art is the logical outcome. The final element is that notion of being from the “voiceless generation”. I always felt that I wanted a large area to make my voice heard. 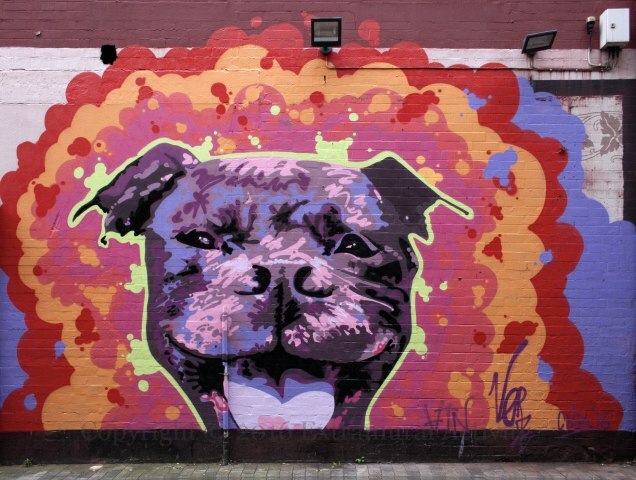 Were you mainly working on Street Art with local councils? I remember that I did work with Waterside Area Partnership in Derry/Londonderry to make some local tunnels which lead to a shopping centre more people-friendly. I was travelling up to Derry every day to work on creating art works in those tunnels and that was when I knew that this was what I wanted to do. 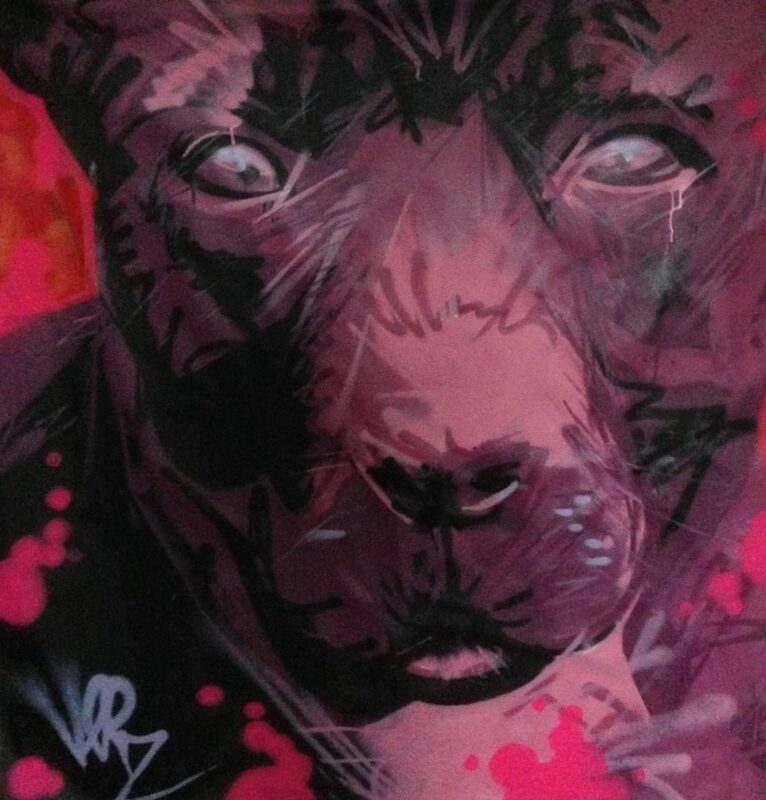 I loved how spray can art worked, I loved the textures, I loved t he form, the process of creating through spray painting. Every aspect of that orientation fitted exactly with what I wanted to do artistically.So I moved in that direction with regards my own art and my work. Did you study street art? Yes. I began to look into it seriously, looking into what was happening globally, learning about the different styles and approaches from portraiture, to the paste-up styles to abstract artworks. I wanted to immerse myself in the art form and educate myself about it as much as work on the practice of it. 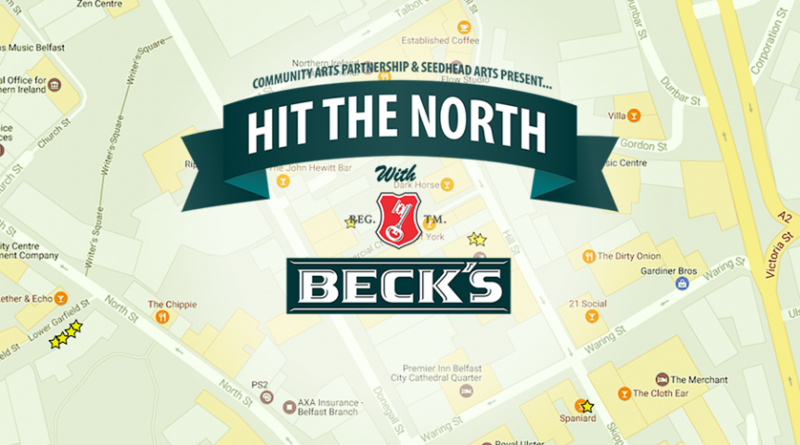 How did you get involved with Hit the North Festival? 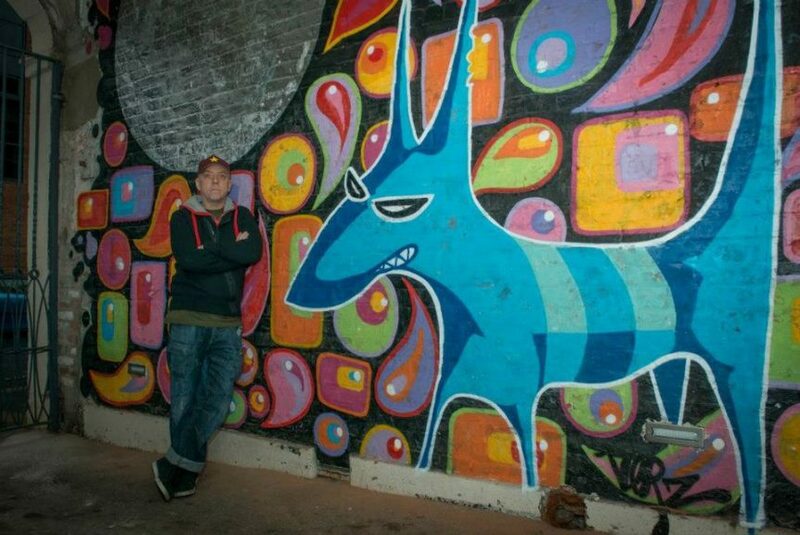 Adam Turkington was the curator of Street Art projects in Belfast and was on the look-out for local artists. He was working closely with a group called the “Spoom Collective” who had been chosen to be part of an exhibition in the Ulster Museum. I did a live piece at the opening of that exhibition and from there we all met up and started to work together. Adam had some funding for a street art festival and he talked to me about what he wanted to do and that was the “Hit the North” festival. I was also thinking about putting on some sort of festival but I thought I should simply roll in behind Adam’s vision. That was a few years ago and I have been working on that festival as well as doing community arts projects with Community Arts Partnership which is another part of the Hit the North project. Effectively I am working with a genre that I feel totally committed to, I work with young people and local communities which I really enjoy and all in all I am in a situation where I am being constantly creative, and that is what I set out to do when I left my job at the BBC. What is the process by which you create a new art work? A few years ago I was having a discussion about dogs, I think it was with my sister, and how aggressive a particular breed of dog was. I was trying to explain that a Staffordshire Bull Terror was not necessarily an aggressive dog. That lead to me thinking about how people can be judged by the way we look. I was often judged in a particular way, either at work or in life, because I had tattoos, a Mohican haircut at one point, piercings or I dressed in a particular way. I always hated that and I thought I could make a connection between the way people judge dogs without any attempt to find out what the dog is actually like, and the way I have been judged and the way people judge others. With dogs in particular, people judge Rottweilers, Dobermans or Staffies, all of which have a reputation as being dangerous regardless of whether that is true or not. If people come across these dogs in the street generally they would be wary of them. It is almost as if these dogs are “devil dogs”, aggressive and dangerous.That was the metaphor I decided to use to make the point that we shouldn’t judge people based on the way they look. We all do that, even after working with young people, especially young people for nearly twenty years, I catch myself doing that and I think it is something that we should try not to do. You now work on painting dogs. How do you go about creating a new artwork? I generally work on paper first, and I would work from photographs. Now that I am known for this work, I get photographs sent to me, photographs of family pets, photographs of those breeds of dogs. I make sure that the dogs are painted in a particular way; I remove any sense of aggression, they look happy, they look friendly and I also add elements around the paintings to project a particular type of atmosphere. Often the dogs have their tongues out, they are situated in colourful surroundings. I did decide that I wanted to move in a more personal direction; I was brought up with dogs, I have always liked dogs and that just worked well for me in terms of making a point with the artwork I was creating. This seems a similar process to the work you did on “subvertising”? The subvertising I did many years ago was about challenging the way advertising portrayed woman and now I am challenging the idea of prejudice. 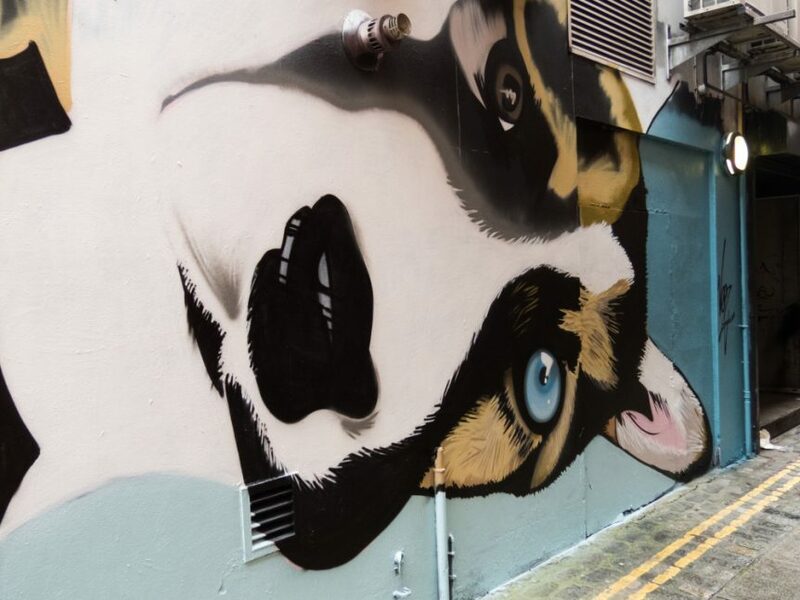 How do you get walls to paint the dog portraits on? Sometimes people come to me and I get commissioned to do something. They already have organised the wall they want to put me on and so I work on the wall they have offered me. At festivals I might have to paint on MDF board or something like that; it’s not always ideal, but whatever is offered you have to work on that. I like to work with different styles, I like to challenge myself and so whatever I might have produced on a page as a template, I then approach the painting as it appears on the surface I’m working on. I might add things that are not in the original drawing or the photograph I’m working on. I often use a cartoonish style so I will be reworking the image until I’m satisfied with it. 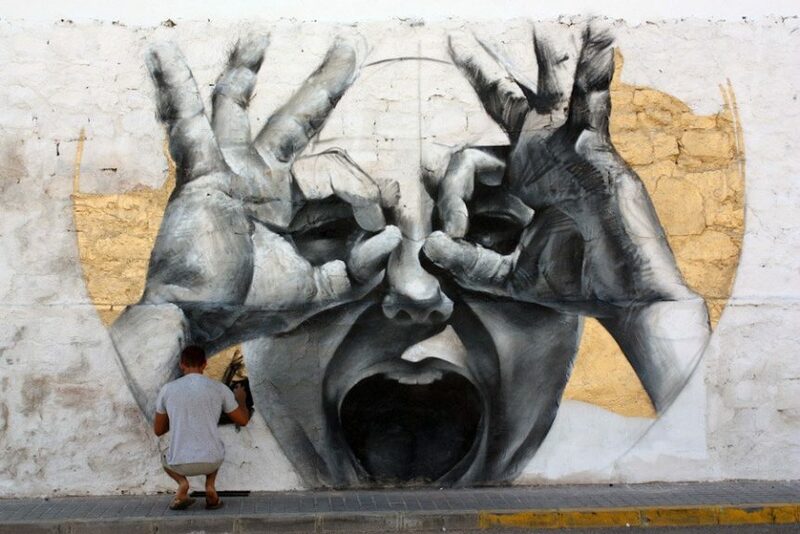 How do you cope with the transient nature of street art? It’s the nature of what we do. I’ve painted on many walls that have been knocked down by developers. I make sure that once the work is finished I get a photographic record of it and I keep that, but there is very little you can do about your work once it is finished. If the developers don’t get it eventually the weather will degrade the work. We do use UV resistant paint but the cold wet weather here, the damp, impacts your work and we all know that and that’s fine. As I’ve said I am committed to the work that I do and so it just doesn’t worry me that paintings that I have created have a limited lifespan. That’s simply to be expected if you are working on walls.